This is an up-close look at teachers and their pets in a school on the Prairies, followed by the long-lasting effects of these pressures on the next generation in the Ottawa valley. There is the golden woman teacher, beloved by all her pupils who cannot find love in her own life. Also unforgettable is the 32-year old bachelor, brilliant as teacher and principal, but sadistic and finally defeated by a mental breakdown. The narrator is the niece of the star woman teacher, Connie Flood. It is up to her to tie in the family relationships, many of them in an Ottawa that we all know. It is a wrenching story altogether and brings in not one but two rapes and murders that come out of the unhealthy relationships developed at the Prairie school. It is a curiously timely moment to be reviewing the book, with world-wide attention on scandals with the head of the International Monetary Fund, as well as the governor of California grabbing the headlines. Alone in the Classroom has the intuitive, penetrating writing we have come to enjoy with Hay’s earlier books, like Late Nights on Air, and Garbo Laughs. 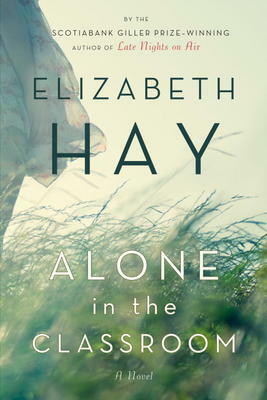 It is a much grimmer tale but Hay does not duck the ramifications and reviews call this her most compelling novel yet. Come down to meet author/singer songwriter Pat Moore who will be reading and signing her children’s book “Clean Water for Lukong” from 1:00pm to 3:00pm on Saturday, May 28. Drop in and enjoy the fun sing-along of “The Kumbo Water Song” that Pat wrote to accompany the story. Illustrator Mary Moore, will also be here to tell you about the illustration process. Come by the store, sing a song, buy a book, and get it signed! We look forward to seeing you all on Saturday! Come on down to Books on Beechwood on Saturday, May 7 to meet children’s author Barbara Patterson. She has written a book called “Jenny” and will be here in our store to sign from 1:00pm to 3:00pm. “Jenny” is the story of a young girl named Jenny who spends a wonderful day with her Grandmother, awaiting the arrival of a new baby in the house. We hope you can all make it down to the store on Saturday, May 7! We look forward to seeing you!